Amy Schoenberger went to Morocco to see firsthand the work done by Nest, a non-profit she works with. A reader story. FES, Morocco – We wake up in Fes and Rebecca leads us in a brief yoga practice in the lobby of our beautiful Riad Tizwa. We have a breakfast of homemade yogurt, fruit, and croissants. Rebecca Kousky is the founder of Nest, a non-profit that gives loans to women artisans in developing countries, provides education and business training, and gives them access to the Western market. The women, in turn, repay Nest in product. Last April, I went with fourteen other Nest board members from all over the United States to Morocco to visit some of our loan recipients in their communities. We leave the riad and proceed to the famous tanneries where women cut and dye leather. We visit the shop where Nest's leather bags are handmade by local artisans, and Rebecca speaks to the shop owners about tweaking a bag design to make it more appealing to the U.S. market. The finished product will be a collaboration with another Nest recipient, a rug-weaving cooperative in Midelt in the Atlas mountains: a leather tote bag with the rug fabric sewn onto the front. A beautiful combination of materials and patterns from two Moroccan craft traditions. We walk outside to the roof of the shop overlooking the tanneries. In one area, they are washing leather; in another, they are cutting skins. A central area is filled with large vats of colorful dyes. You have to hold a mint leaf to your nose to mask the smell because the dye, which is made with pigeon stool. After observing the wonderful scene for a while, I go back into the shop and use my stellar bargaining skills to score a beautiful pair of orange shoes. The drive to Midelt is breathtaking — mountains, fields, and wildflowers everywhere. We stop the van to let some sheep cross, and the herder picks up a baby sheep and hands it to our driver. After passing the sheep around so everyone on the bus can hold the little guy, we return the sheep (the mama sheep was not too pleased) and continue our journey. Once in Midelt, we park on a narrow street and are ushered through a door, greeted by a number of traditional Muslim women with head coverings, long skirts, and long grey tattoos down the middle of their faces, an ancient Berber symbol of marriage. They kiss us twice on each cheek and we enter the home. They have been anxiously awaiting our arrival. We sit around three large tables and they serve us abundant quantities of chicken, bread, couscous, carrots, fruits, and more. After dinner, the women bring out brightly colored handheld drums. The music, dancing, and singing begins — and this Jewish white girl finds herself dancing with these women the way she does with her roommates in New York. And this is why I do what I do. The rest of the evening is unforgettable. We visit the rug-weaving cooperative founded by Hayat, one of Nest's recipients. We return to her friend's house, where the women are still dancing and singing, and one woman gives us henna tattoos. They serve us tea and dessert. 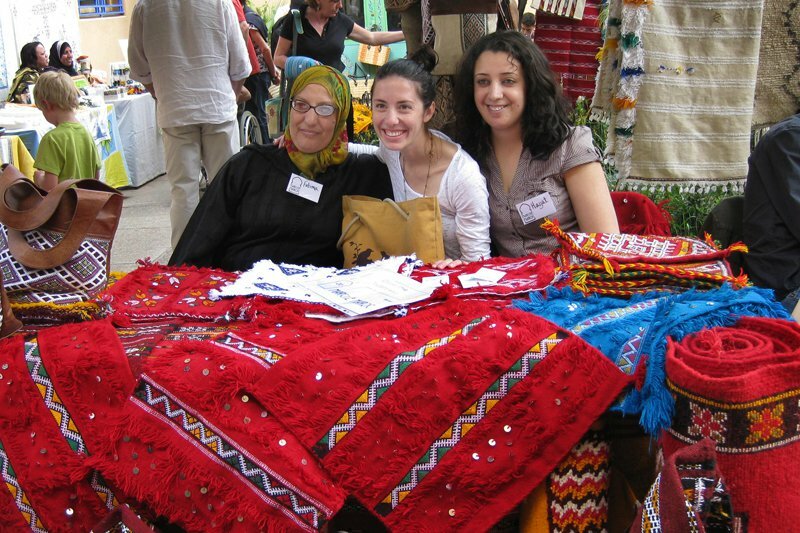 At some point in between a woman teaching me their shrieking technique and playing with another woman's daughter, I realize why I spend so much of my free time in New York doing things for Nest, why I have spent so much of my savings to come to Morocco and meet these women. When I relay these thoughts back to the group at the hotel, I know we've all come to the same conclusion: We are part of something phenomenal. Rebecca sheds a few tears as she talks about the women we met today. Most are unmarried or divorced, mostly because, according to Hayat, the men don't work as hard. To these women, hard work is a huge value. I think about how this relates to my own life and what I've seen in America. Rebecca is overcome with emotion; she is so happy we have made a difference in the lives of these women. And she's thrilled to be with the fourteen of us because we share her passion and because we have connected on a deep, personal level with the women we've been helping from our hometowns in the U.S. by throwing parties and fundraisers. This is a whole level beyond admiring the pretty jewelry we buy from the website and sell at events. She tells the story about how Hayat attended a rug fair in Germany earlier this year to show her cooperative's rugs to an international market. It was probably the first time anyone from her village had ever left Morocco. Hayat is able, despite cultural and religious constraints, to be an independent business woman in her village. And Nest has a big role in that. It's amazing to think about the impact our little trunk show parties in the United States can have across an ocean. A version of this story orignally appeared on Amy's blog, Amy Atmosphere.